I have been on the fence about the overall trend since last summer. Although I love the “idea” of wearing overalls I can’t seem to commit to them. I have tried a couple of different styles, but have not found one that doesn’t make me look like an overgrown twelve year old. Have I passed my overalls prime? Well never one to give up on a trend…I went in search of some possible grown up options and I found some great choices and tips on how to make this look work for me. 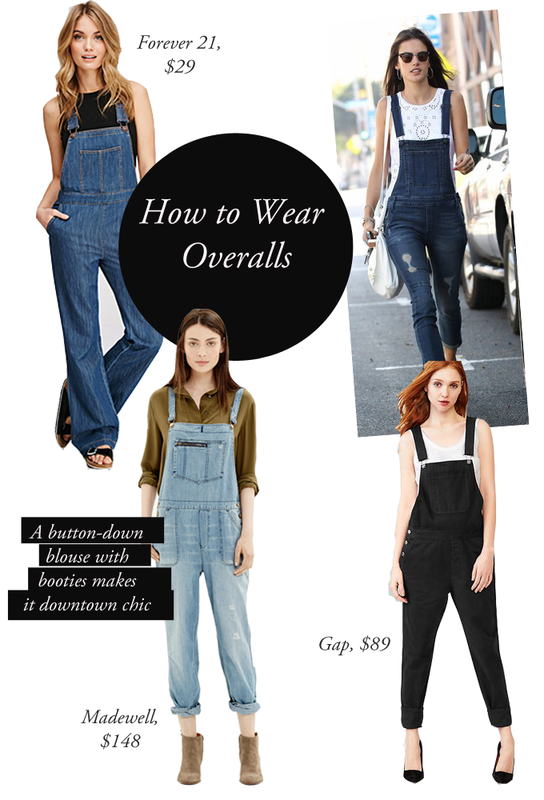 Overalls just like your jeans come in several different shapes and styles such as loose, skinny, tapered and wide leg. They also come in a variety of colors and patterns, however as much as I love a pattern there is no way that I am wearing patterned overalls. I did my time back in the 90's with my teased hair and Reebok high-tops. So the first step is to choose which style you want to rock. I would try on a few different ones in order to find the most flattering on my body frame. Next is picking out the shirt that will be peeking out from underneath your cool new overalls. I highly suggest a simple fitted top in order to keep your silhouette looking slim and polished. However, I also found that a button down blouse a la Madewell (whether patterned or solid) can give your look a cool downtown vibe. Overall this is a trend that I will conquer this summer.